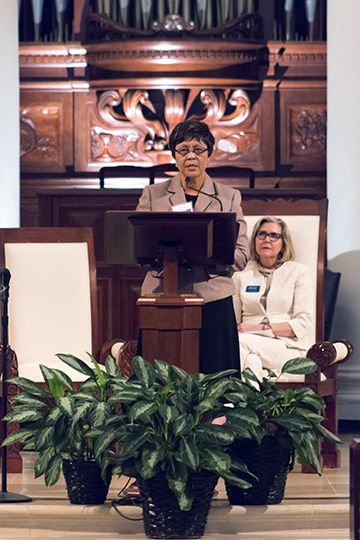 Attendees of a national conference on racial reconciliation at Samford University March 9–10 were told that while there has been some progress, not much has changed since Birmingham’s Sixteenth Street Baptist Church was bombed in 1963, killing four young girls. The events in Birmingham, however, compelled McKinstry to deal with reconciliation, which she shares in her book, and has led to becoming an international lecturer on reconciliation. A Beeson Divinity School graduate and member of Samford’s board of overseers, McKinstry has visited 22 states and eight countries, sharing her “reflections on how a 14-year-old black girl grew up” as most of the world watched events in Birmingham. The conference was hosted by Birmingham Mayor William A. Bell, Bishop Robert J. Baker of the Catholic Diocese of Birmingham and Dean Timothy George of Samford’s Beeson Divinity School. More than 250 attended in person, and about 500 watched via live stream. The conference also featured talks by Joseph P. Riley Jr., mayor of Charleston, South Carolina; Alabama Attorney General Luther Strange; the Most Rev. Edward K. Braxton, Catholic bishop of Belleville, Illinois; Professor Emeritus Wayne Flynt of Auburn University; and the Most Rev. Anthony Obinna, Catholic archbishop of Owerri, Nigeria. Bell called Birmingham “ground zero in civil rights” and told of what it was like growing up in a segregated society. “That’s the way it was,” he said, noting that the majority, both black and white, remained silent during the time. However, the bombing of Sixteenth Street Baptist Church was “heard around the world,” and events such as the 1950s bus boycott in Montgomery, Alabama, brought people together, and changes were made. Riley told the gathering that building relationships in advance of tragedy is the key to a successful relationship between races. Strange, who grew up in the Birmingham area, acknowledged that he didn’t know or understand the problems of racism when he was growing up as he was only 10 years old when Sixteenth Street Church was bombed. “Racism is real,” he said. “We have come light years, but we need to do more about it.” He suggested an emphasis on history, leadership, neighborhood policing and the role of religion. Despite the social ills of mental illness, gun violence and drugs, Strange said he was optimistic about the future. Braxton addressed the emphasis on “minority” and the Black Lives Matter movement. “Scripture teaches that in Christ there is neither Greek or Jew, slave nor free, male nor female, neither north nor south, east nor west. All are redeemed sinners transformed by Christ as members of his mystical Body with equal dignity before God,” he shared. The same is accurate as it relates to the Black Lives Matter movement, which, he suggests, is not that important to Catholics as the church teaches that in Christ all are created equal. “Before God, there is no racial divide because the life, teachings, wondrous signs, suffering, death, resurrection and ascension of Christ and his Pentecost gift of the Holy Spirit has redeemed all, “ he added. Braxton concluded with the suggestions of pray, learn, think and act. Flynt told of his visits with author Harper Lee and how he was surprised to learn that her reading included the complete works of C. S. Lewis, especially her favorite, Mere Christianity. After explaining the genesis of her two books, he read extensively her portrayal of lawyer Atticus Finch more as a product of his social environment than a just and honest lawyer in To Kill a Mockingbird. Flynt suggested such a legacy exists today and is rather relevant to the conversation of the conference. The conference also included two panels. The first panel featured civil and political leaders, and was moderated by S. Jonathan Bass, Samford professor and university historian. In addition to the three plenary speakers, members of the panel included Judge Helen Shores Lee and Birmingham Police Chief A. C. Roper. They were asked to share what it takes to be a civic leader. Lee suggested that all have to be “physically” involved. A veteran of the Civil Rights Movement, she told of her home being bombed, but that didn’t stop her from being involved in her community. “Always give back to your community,” she said, claiming institutional racism is still rampant, especially in court rooms. “You’ve got to know history and get involved in your community,” she said. The second panel, dealing with healing and harmony as reconcilers, was moderated by Fisher Humphreys, Beeson Divinity School professor emeritus, and included religious leaders from Christian, Jewish and Islamic faith traditions. Presbyterian minister Edwin Hurley confessed that he didn’t know about segregation growing up, but that he is not racist and, although not perfect, he and his church are seeking to be reconcilers. Birmingham inner-city pastor Joel Brooks shared how he responded to his wife about their home being burglarized or robbed four times. As a result, their children are afraid of young blacks. Ashfaq Taufique, president of the Birmingham Islamic Society and a native of Pakistan, told that when he applied to colleges in the U.S., a question on every application asked for his race. “Not knowing,” he said, he always marked “other.” Regardless of one’s faith, he suggested, there is not room for discrimination based on anything. “We are all crated in the image of God,” he said. Two Birmingham-area pastors, Michael Moore and James Lowe, echoed a need for repentance before reconciliation can take place. They maintained that both the offended and the offender must repent if true reconciliation is to take place. The conference concluded with an address on reconciliation by Obinna and a prayer service led by George.